Everyone loves their wine, are we right? If you are someone who loves making wine as a pastime and are ready to take it to the next level, read on! When choosing who you want on the job, you want someone with experience, who is trusted, and who is honest and hardworking. That’s where Watkins Architect can step right up to the plate to support you and your goal! When looking into Watkins Architect as an option, you can be sure we know what we’re doing when it comes to architectural services. With experience such as designing and continuing to plan projects for Folino Winery, you can rest easy knowing that we can handle designing your winery. 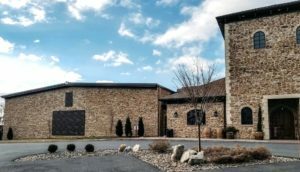 The Folino Winery was designed by Watkins Architect, and with their recent addition to their restaurant, an additional 10,000 square feet of space was added for their winery. This space will be utilized as their new fermentation room that is able to hold up to 147,000 gallons of your beloved wine. The new addition will also house a Barrel Room. This room can hold up to 400 barrels of wine, and is perfect for small events! Along with the banquet hall, outdoor patio, entrance, and more comes the authentic Italian-Tuscan feel customers come to desire! If you’re in the area check them out, and also check out their new location, Vinter’s Table, which recently opened in Phoenixville! Kutztown isn’t the only area Watkins Architect has operated in; other locations include Reading, Ephrata, Fleetwood, Hamburg, and more! You don’t just want anyone helping you set up your winery – get someone who has the right experience and ideas! Contact us to set up a consultation to start discussing your winery project. Watkins Architect is a local architectural firm that can handle everything from designing your project to managing it. Watkins Architect handles all types of architecture projects as well as interior design and corporate branding throughout the Pennsylvania area. Browse through our portfolio to find out what architecture projects we have completed.